My new work, Pianos, is a concerto for solo piano/sampler keyboard and large chamber ensemble with extensive live electronics. 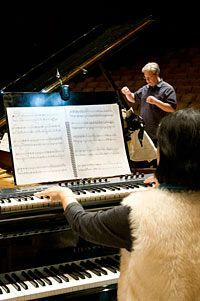 Performed by renowned (former Regent's Lecturer) Gloria Cheng, the piece is a collaboration with UC Berkeley's Center for New Music and Audio Technologies (CNMAT), and makes use of an extensive archive of sampled piano recordings. Several years ago, this database at CNMAT was created from session recordings of one of the Music Department's concert grand pianos in Hertz Hall. Over a period of weeks, four tones (C, E-flat, F-sharp, and A) in every octave were carefully recorded using multiple microphones and with numerous different playing modes: for example, playing with mallets inside the piano, plucking the piano strings (pizzicato), and playing with various prepared piano devices, such as caulk, magnets, tape, and even a superball. Over the last year, I have taken portions of these recordings, cut them into short audio segments (usually about 1-5" in length) and mapped them onto a sampler keyboard, so that the unusual sounds and timbres could be played with easy facility by a pianist. Playing with mallets or plucking inside a piano is usually a tricky and limited maneuver in a live performance situation; this approach allows a level of ease and virtuosity not technically possible otherwise. My inspiration for Pianos is to combine traditional "on the keys" playing (using one of our very fine nine foot grand pianos in Hertz Hall), with the sampler keyboard's "inside the piano" sounds, thus creating an extended sort of super-piano that is capable of a greatly extended range of timbres and colors. The enhanced palette of piano sounds thus interacts with the accompanying ensemble's varied timbres and sonic possibilities. This supporting ensemble consists of flute (doubling bass flute and piccolo), oboe (doubling English horn), clarinet (doubling bass clarinet), bassoon (doubling contrabassoon), horn, percussion, harp, 2 violins, viola, cello, and double bass. I would like to thank Daniel Cullen, Myra Melford, and Edmund Campion for their work creating the session recordings in Hertz Hall, and Ilya Rostovtsev for his technical assistance creating the sampler software.